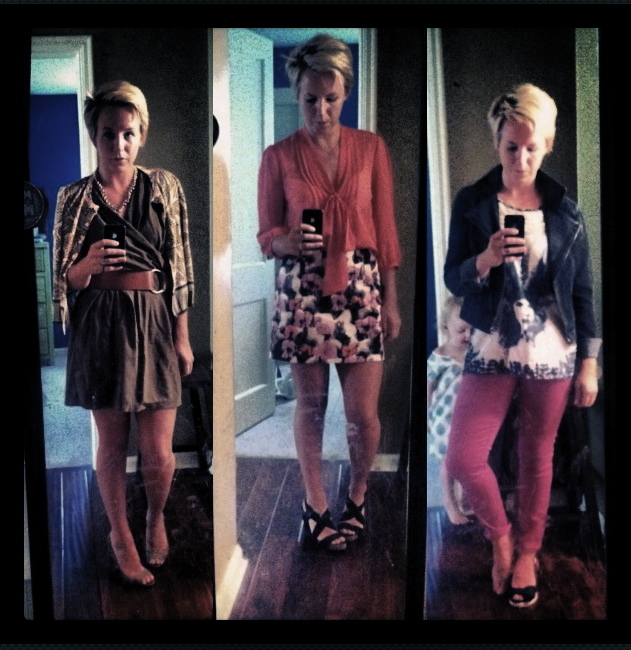 do you ever play dress-up in your own closet? before i had kids i used to do it all the time. i'd spend an hour or so coming up with different combinations of things i already owned. i haven't done it as much in recent years, but i think it actually saves time to create a queue of outfits to pull from. so many times (or...everyday) i rush to get out the door and end up wasting a bunch of time (and making a huge mess) trying on 5 different things before i settle on something. way better to do the "work" when you're not rushed and when there's no pressure to come up with an outfit for that very moment. this week i have a few different things to get dressed for, so i spent a little time trying on outfits while simultaneously cleaning my closet. (my parents are coming this week-- time to clean.) now i have five different outfits hanging in my closet, ready to wear! warning: the above picture contains not a strand of clean hair nor a stitch of makeup. woof. i do the same thing!! very cute outfits!! a bad credit score, there could actually be some great private lenders on the market seeking to give you a hand. Themselves how such a person would like ah. north face factory outlet cheap north face factory outlet way is angry with himself, unwittingly came to the school. Both because of a long walk on north face factory outlet the road, so going to school after class. Just the way of pedestrians constantly pointing north face factory outlet I want to the north face outlet store go to buy you clothes to wear, but they think if you buy a case of cheap do not how to do north face factory outlet it, but he claimed the sale of most personality. to them. Others exclaimed why beggars walk together with beauty. There are young people ready to write a north face factory outlet literary magnum opus the north face outlet storebeggars and beautiful day together, more pictures, and after finishing the north face factory outlet camera shattered, cursed fate . deliberately exaggerated. cheap tiffany uk sale Bald brother was hit, really, just now, that kid will use a trick, cheap tiffany uk sale bald brother like a bird flew cheap tiffany uk sale Suspicious tiffany jewellery uk sale nature, this time can not help but suspect that this is the younger brother of counseling cheap tiffany uk sale package, out and then boom like a bomb as soon hit the wall, tiffany london sale bloody ah .